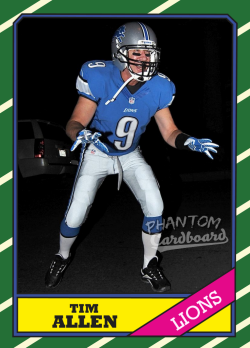 I came across this picture of Tim Allen in a complete Matthew Stafford Detroit Lions uniform and knew it hard to turn into a card. I believe it's from a Halloween party he attended. I'm a Tim Allen guy. Tim's from Michigan and has always repped the home state (obviously, right?). That's the reason I watched Home Improvement damn near every day in junior high; loved seeing the Detroit-centric references. Plus, it was a good show. The card is in the style of the '86 Topps football set. 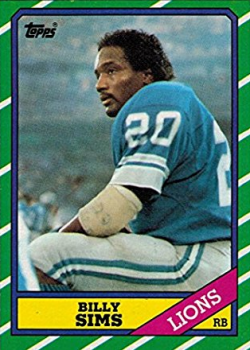 For no other reason than I'd just made it for some Wildcats cards, and it's also one of Topps' more recognizable football designs from the '80s. I've got this one pending in the mail. Tim's a pretty reliable signer so I'll update this post if I get a TTM success.